NF-κB/Rel transcription factors, implicated in inflammatory and immune responses against pathogens, are regulated by IκB proteins. The physiological and molecular function of the IκB family member Bcl-3 is understood only poorly. In this study, the role of Bcl-3 in an innate immune response was examined by gene targeting. We demonstrate that Bcl-3−/− mice are highly susceptible to Listeria monocytogenes infection. This correlates with diminished production of IL-12 p70 and IFN-γ in vivo, which is mainly due to elevated synthesis of IL-10. Isolated peritoneal macrophages from Bcl-3−/− mice also produce elevated amounts of IL-10, which inhibit IL-12 p70 synthesis in an autocrine fashion. Thus, these data establish Bcl-3 as an inhibitor of IL-10 expression in macrophages. Furthermore, we show that Bcl-3 is not implicated in IL-10 mRNA stabilization but regulates the initiation of IL-10 transcription. Taken together, our results show that an essential function of Bcl-3 during an innate immune response against bacteria is to inhibit transcription of the IL-10 gene in macrophages. Transcription factors of the NF-κB/Rel family play a pivotal role in the acute-phase response, immune response, cell proliferation, and apoptosis (1). The five mammalian NF-κB/Rel family members RelA (p65), RelB, c-Rel, NF-κB1 (p50), and NF-κB2 (p52) contain a conserved DNA-binding and dimerization domain (Rel homology domain) and form various homo- and heterodimers. In contrast to p65, RelB, and c-Rel, the p50 and p52 subunits lack a transactivation domain and are produced either by processing of the respective precursors NF-κB1 (p105) and NF-κB2 (p100) or by a cotranslational mechanism. The NF-κB dimers are kept in the cytoplasm through interaction with ankyrin-repeat containing proteins of the IκB family consisting of IκBα, IκBβ, IκBε, IκBζ, the NF-κB precursors p105 and p100, and Bcl-3. In response to a variety of stimuli, including proinflammatory cytokines, growth factors, microbes, and viruses, IκB proteins are phosphorylated by a multiprotein IκB kinase complex (2). Consecutively, phosphorylated IκBs are ubiquitinated and degraded by the 26S proteasome, releasing the NF-κB dimers to enter the nucleus and activate transcription of target genes. Depending on the sequence of NF-κB binding sites and/or the promoter context, the target genes are regulated by distinct NF-κB dimers (3, 4, 5). Bcl-3 was originally identified by cloning of the breakpoint junction in the t(14,19) translocation, a rare but recurrent abnormality in human B cell chronic lymphocytic leukemia (6). In contrast to the other IκB family members, Bcl-3 specifically interacts with the intrinsically inactive p50 and p52 homodimers in the nucleus and is not degraded after cellular stimulation (7, 8, 9, 10). Depending on phosphorylation and concentration of Bcl-3, it can act either as an IκB, dissociating p50 and p52 homodimers from DNA, or as a coactivator that is recruited to DNA by p50 and p52 homodimers (7, 8, 9, 10, 11, 12). Additionally, Bcl-3 regulates the subcellular location of p50 homodimers. The overexpression of Bcl-3 in pro-B cells or thymocytes resulted in augmented amounts of p50 homodimers in the nucleus (13, 14), while internally induced Bcl-3 causes an export of p50 homodimers from the nucleus to the cytoplasm in hepatocytes (15). Studies of Bcl-3−/− mice revealed a requirement for Bcl-3 in spleen architecture, formation of germinal centers, and production of Ag-specific Abs and in the defense of pathogenic infections but could not identify a specific target of Bcl-3 (16, 17). Macrophages are an indispensable component of the innate immune system. Activated by recognition of microorganisms through specific receptors, they phagocytose the pathogen and secrete cytokines, chemokines, and other immunologically active molecules to induce and regulate an inflammatory response (18). Furthermore, macrophages act as APCs to induce an adaptive immune response. Among the cytokines secreted by activated macrophages, TNF-α, IL-12 p70, and IL-18 stimulate the production of IFN-γ in NK cells, which enhances microbicidal macrophage functions. To guarantee a balanced immune response, activated macrophages concomitantly synthesize the anti-inflammatory cytokine IL-10, which inhibits macrophage functions such as cytokine production and Ag presentation by MHC class II molecules (19). The physiological significance of IL-10 as an immunosuppressive factor is obvious from the analysis of IL-10 deficient mice, which are more resistant to various infections compared with wild-type animals but develop chronic enterocolitis and have a higher risk to die from a toxic shock-like syndrome (20, 21, 22). In contrast, transgenic mice overexpressing IL-10 in macrophages exhibit increased susceptibility to bacterial infections and hyporesponsiveness to endotoxin challenge, compared with wild-type mice (23, 24). Furthermore, administration of exogenous IL-10 has shown amelioration in murine models of inflammatory and autoimmune diseases (19). In this study, we show that high susceptibility of Bcl-3−/− mice to infection with Listeria monocytogenes correlates with diminished production of IL-12 p70 and IFN-γ, which is mainly due to an elevated expression of IL-10 in Bcl-3−/− macrophages. Furthermore, we demonstrate that Bcl-3 does not affect the IL-10 mRNA stability but inhibits the transcription of the IL-10 gene. A 6.5-kb genomic clone containing exons 3–9 of Bcl-3 was isolated from a 129/Sv mouse kidney library. The targeting vector was constructed by replacing a 1.6 kb XmnI-EcoRV fragment encoding the ankyrin repeat sequences 1–4 of Bcl-3 with an MC1polyA-neomycin (neo)3 cassette (Stratagene). The HSV-thymidine kinase (tk) gene was inserted 3.5 kb downstream of the neo cassette. The length of the homologous sequence upstream of the neo cassette was 0.8 kb. Embryonic stem cells (line E14.1) were electroporated with the linearized targeting vector (30 μg) and selected with G418 (200 μg/ml) and gancyclovir (2 μM). Resistant clones were screened for homologous recombination by PCR. Positive clones were verified by Southern blot analysis using an external 5′-flanking probe and a neo probe. The frequency of homologous recombination was one in nine double-resistant colonies. These clones were aggregated with CD1 morulae, and resulting chimeric mice were backcrossed to CD1 mice. Germline transmission was evaluated by coat color and verified by Southern blot analysis of tail DNA. Homozygous offspring was obtained at the predicted frequency by interbreeding heterozygous mice. The null phenotype created by the mutation of the Bcl-3 gene was confirmed by Western blot analysis of spleen extracts. Whereas Bcl-3−/− and wild-type littermate control mice used for L. monocytogenes infection were not backcrossed, mice used for LPS injection were backcrossed five times with C57BL/6 mice. Bcl-3−/− mice backcrossed 10 times with C57BL/6 mice and C57BL/6 wild-type mice as controls were used for in vitro experiments. All mouse protocols were approved by the appropriate government authorities. Fifty micrograms of whole-cell protein extracts were resolved by SDS-polyacrylamide (10%) gel electrophoresis and electrotransferred to Immobilon P membranes (Millipore). The membranes were then blocked with 5% nonfat milk-TBST (10 mM Tris-HCl (pH 8.0), 150 mM NaCl, and 0.2% Tween 20) for 2 h and incubated with a specific anti-Bcl-3 Ab (Santa Cruz Biotechnology) diluted 1/500 in 5% nonfat milk-TBST overnight. After three washes with TBST, the membranes were incubated with a HRP-conjugated goat anti-rabbit IgG Ab in TBST for 2 h and washed three times with TBST. Immune-reactive proteins were detected using an ECL visualization system (Amersham Biosciences). For detection of Bcl-3 phosphorylation, protein extracts were incubated for 30 min with calf intestine phosphatase (CIP; New England Biolabs) at 37°C. Inoculation of mice with L. monocytogenes (ATCC strain 43251) was performed as described previously (25). Blood was taken from the tail vein 24 h after inoculation for determination of TNF-α, IFN-γ, and IL-12 p70 levels by ELISA. Mice were injected i.p. with 10 μg of LPS (L-3129; Sigma-Aldrich)/g body weight. The mice were bled 0, 1, 4, 8, or 12 h later, and serum levels of IL-12 p70, IL-12 p40, TNF-α, IFN-γ, and IL-10 were measured by ELISA. Endogenous IL-10 was neutralized by i.p. injection of anti-IL-10 Ab (1 mg, JES5-2A5; BioLegend) 2 h before LPS administration. An Ab specific for keyhole limpet hemocyanin (1 mg, RTK2071; BioLegend) was used as an isotype control. Cytokine levels in blood sera and culture supernatants were determined using commercially available ELISA kits, according to the manufacturer’s instructions (R&D Systems). Spleens were suspended by pressing through a cell strainer, and erythrocytes were removed by ammonium-chloride lysis. The splenocytes were maintained at 2 × 106 cells/ml in 24-well plates (BD Falcon) in RPMI 1640 medium with l-glutamine (Invitrogen Life Technologies) containing 10% FCS (HyClone) and penicillin-streptomycin. The splenocytes were stimulated with murine rIL-12 p70 (10 ng/ml; Sigma-Aldrich), murine rIL-18 (10 ng/ml; R&D Systems), murine rTNF-α (10 ng/ml; Sigma-Aldrich), or combinations of these for 24 h. Culture supernatants were assayed for IFN-γ by ELISA. Mice were injected i.p. with 3 ml of 3% Brewer thioglycollate solution. Three days later, peritoneal exudate cells were obtained by flushing the peritoneal cavity with 10 ml of DMEM (Invitrogen Life Technologies). After multiple washes, the cells were resuspended in high-glucose DMEM containing 10% FCS (HyClone), 2 mM l-glutamine, and penicillin-streptomycin and plated at 3 × 107 cells/100-mm plastic dish (BD Falcon). Two hours later, nonadherent cells were removed by three wash steps, and the enriched macrophages were used for experiments in 6 ml of medium. Reagents used to treat peritoneal macrophages were LPS (100 ng/ml, L-3129; Sigma-Aldrich), neutralizing anti-IL-10 Ab (20 μg/ml, JES5.2A5; BD Pharmingen), isotype-matched control Ab (20 μg/ml, YCATE55; BD Pharmingen), actinomycin D (10 μg/ml; Sigma-Aldrich), and murine rIL-10 (25 ng/ml; R&D Systems). Total RNA was isolated from peritoneal macrophages using the RNeasy Minikit (Qiagen) combined with a DNA digestion step (RNase-free DNase set; Qiagen). First-strand cDNA synthesis was conducted with 2 μg of RNA using the Superscript II system (Invitrogen Life Technologies). For relative quantification of mRNA, the amplification of sample cDNA was monitored with the ABI PRISM 7700 detection system (Applied Biosystems) using the fluorescent DNA binding dye SYBR Green (Applied Biosystems). Target mRNA levels in each sample were normalized to the endogenous cyclophilin mRNA levels. Primer sequences are available on request. After stimulation, 3 × 106 peritoneal macrophages were fixed at room temperature by adding formaldehyde (1%) to the culture medium. After 10 min, cells were washed twice with ice-cold PBS, lysed on plate in L1 buffer (50 mM Tris (pH 8.0), 2 mM EDTA, 0.1% Nonidet P-40, 10% glycerol, and protease inhibitor mixture (1/200, P-8340; Sigma-Aldrich)), and transferred to a reaction tube. Nuclei were pelleted at 3000 rpm and resuspended in L2 buffer (50 mM Tris (pH 8.0), 5 mM EDTA, 0.1% SDS, protease inhibitor mixture (1/200)). Chromatin was sheared into fragments of an average size of 400 bp with a sonifier (3 × 30 s at 60% of maximum power; Bandelin), centrifuged to pellet debris, and diluted 10-fold with dilution buffer (50 mM Tris (pH 8.0), 0.5 mM EDTA, 0.2 M NaCl, 0.5% Nonidet P-40, and protease inhibitor mixture (1/200)). Each sample was precleared for 3 h with 80 μl of salmon-sperm saturated protein A agarose (Upstate Biotechnology). Immunoprecipitations were performed overnight at 4°C. The anti-RNA Polymerase II Ab was from Santa Cruz Biotechnology. Antibody/chromatin complexes were collected with 80 μl of salmon-sperm saturated protein A agarose (Upstate Biotechnology) for 1 h and washed three times each with high-salt buffer (20 mM Tris (pH 8.0), 2 mM EDTA, 0.5 M NaCl, 0.1% SDS, and 1% Nonidet P-40), LiCl buffer (20 mM Tris (pH 8.0), 1 mM EDTA, 250 mM LiCl, 0.5% Nonidet P-40, and 0.5% sodium deoxycholate), and 1× TE (10 mM Tris (pH 8.0), 1 mM EDTA). Immune complexes were extracted with 1× TE containing 1% SDS at 65°C. After addition of NaCl (300 mM final concentration) protein-DNA cross-links were reverted overnight at 65°C. Proteins were digested with proteinase K for 2 h, and the DNA was extracted by phenol/chloroform and precipitated with ethanol. One-twentieth of the DNA was used in each PCR (35–38 cycles) applying the following primers: IL-10 promoter (−196/−1), sense, 5′-GCAGAAGTTCATTCCGACCAG-3′, antisense, 5′-GTAGACCTCCTGTTCTTGGTCCC-3′; and IL-6 promoter (−292/-147), sense, 5′-GACATGCTCAAGTGCTGAGTCAC-3′, antisense, 5′-AGATTGCACAATGTGACGTCG-3′. To investigate the role of Bcl-3 in an innate immune response, Bcl-3−/− mice and wild-type control animals were infected i.p. with 5 × 104, 5 × 105, or 5 × 106 CFU of the Gram-positive, facultatively intracellular bacterium L. monocytogenes, and mice were monitored for 12 days. Eighty percent of Bcl-3−/− mice died within 8 days after inoculation with 5 × 104 bacteria, a dose that was sublethal in wild-type animals (Fig. 1⇓A). When the animals were inoculated with higher doses of bacteria, some wild-type mice also succumbed to the infection. However, Bcl-3−/− mice were more susceptible and died more rapidly. In vivo responses to L. monocytogenes (L. m.) in Bcl-3−/− and wild-type littermate control mice. A, Survival kinetics after i.p. infection with the indicated amounts of viable L. m. at day 0. B, Serum amounts of TNF-α, IL-12 p70, and IFN-γ after infection with L. m. Mice were bled 24 h after inoculation with the indicated amounts of L. m., and cytokine serum concentrations were analyzed by ELISA. Each column represents the mean value and SD of five mice. Asterisks indicate significant differences (p < 0.05) from values of wild-type control mice as calculated by Student’s t test. The proper synthesis of the cytokines TNF-α, IL-12 p70, and IFN-γ is a prerequisite for the resistance to L. monocytogenes at early stages of infection (26). To determine whether Bcl-3−/− mice are capable of producing appropriate levels of these cytokines, ELISA was performed with serum of mice 24 h postinfection. Correlating with the higher susceptibility of the Bcl-3−/− mice, serum IL-12 p70 and IFN-γ levels were reduced in Bcl-3−/− mice as compared with wild-type mice (Fig. 1⇑B). In contrast, TNF-α serum levels were slightly increased. To evaluate whether the diminished production of IL-12 p70 and IFN-γ in the Bcl-3−/− mice was restricted to the infection with Gram-positive bacteria such as L. monocytogenes or a more general deficiency, which occurs in the absence of Bcl-3, LPS from Escherichia coli was administered to Bcl-3−/− and wild-type mice. Subsequently, serum levels of TNF-α, IFN-γ, IL-12 p70, IL-12 p40, and IL-10 were measured 0, 1, 4, 8, and 12 h after LPS injection. Similar to the results following L. monocytogenes infection, expression of IL-12 p70 and IFN-γ were diminished in Bcl-3−/− mice, whereas TNF-α production was slightly increased (Fig. 2⇓A). Besides the active heterodimeric IL-12 p70, which consists of an IL-12 p35 and an IL-12 p40 subunit, macrophages produce in large excess monomers and homodimers of the IL-12 p40 subunit (27). Measurement of IL-12 p40 showed no difference between Bcl-3−/− and wild-type control mice after treatment with LPS, suggesting that inadequate IL-12 p70 production is predominantly due to diminished expression of the p35 subunit. The expression of proinflammatory cytokines, including IL-12 p70 and IFN-γ, has been shown previously to be negatively regulated by IL-10 (28, 29, 30). Interestingly, already 1 h after LPS injection, Bcl-3−/− mice produced substantially more IL-10 than wild-type control mice. Furthermore, while in control animals IL-10 levels reached the peak 1 h after LPS administration and declined thereafter, down-regulation of IL-10 was absent in Bcl-3−/− mice. 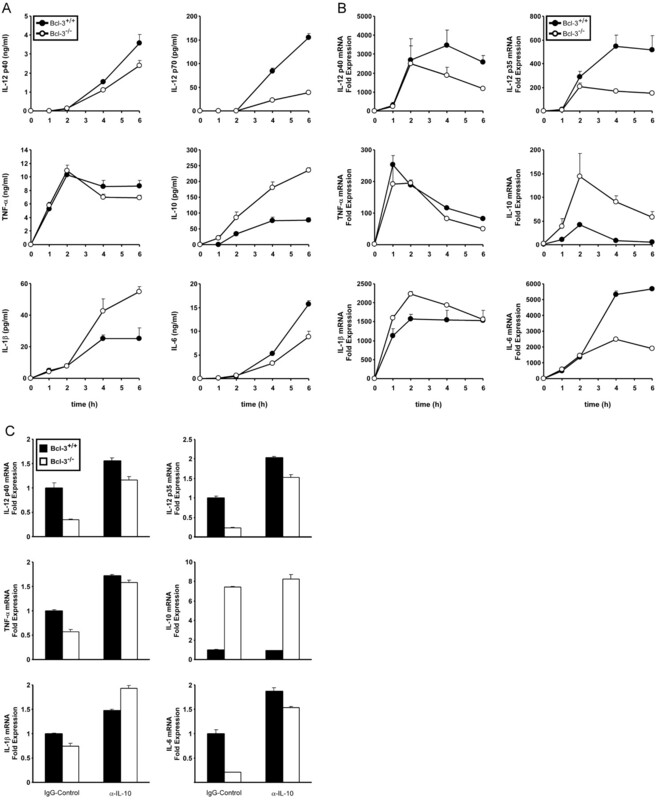 To examine whether diminished production of IL-12 p70 and IFN-γ in Bcl-3−/− mice after LPS injection is due to the excessive secretion of IL-10, Bcl-3−/− and wild-type mice were challenged together with LPS and a neutralizing anti-IL-10 or isotype-control Ab. Measurement of IL-12 p70 and IFN-γ 4 h after LPS administration revealed that expression of both cytokines is strongly inhibited by endogenous IL-10 (Fig. 2⇓B). Furthermore, in the presence of the anti-IL-10 Ab, Bcl-3−/− and wild-type control mice produced equal amounts of IL-12 p70, indicating that diminished production of IL-12 p70 in Bcl-3−/− mice is due to excessive IL-10. The very low expression of IFN-γ in Bcl-3−/− mice, which was only 17% of IFN-γ production in wild-type mice, also approached to 49% of wild-type levels by neutralization of IL-10, probably due to increased amounts of IL-12 p70. However, IFN-γ production in Bcl-3−/− mice was still lower than in wild-type mice, indicating that either IL-10 neutralization was incomplete or, besides the overproduction of IL-10, other mechanisms account for diminished expression of IFN-γ in Bcl-3−/− mice. In vivo responses to LPS injection in Bcl-3−/− and wild-type littermate control mice. A, Serum levels of TNF-α, IL-12 p40, IL-12 p70, IFN-γ, and IL-10 after LPS challenge. Mice were injected i.p. with 10 μg of LPS/g body weight. Sera were taken as indicated after LPS injection and analyzed for cytokine production by ELISA. Each data point represents the mean value and SD of five mice. B, Serum levels of IL-12 p70 and IFN-γ in anti-IL-10-pretreated mice after LPS challenge. Two hours before LPS administration, mice were injected i.p. with 1 mg of neutralizing anti-IL-10 or an isotype control Ab. Sera were taken 4 h after LPS injection and analyzed for cytokine production by ELISA. Each column represents the mean value and SD of three mice. The lower production of IFN-γ in Bcl-3−/− mice in response to LPS largely corresponds to diminished expression of IFN-γ mRNA in Bcl-3−/− spleens (data not shown). To determine whether Bcl-3 is directly involved in the regulation of IFN-γ expression, splenocytes from Bcl-3−/− and wild-type control mice were cultured for 24 h in the presence of IL-12 p70, IL-18, TNF-α, or combinations of these cytokines. The results indicate that IL-12 p70 was not sufficient but an absolute prerequisite for the induction of IFN-γ in both wild-type as well as in Bcl-3−/− splenocytes (Fig. 3⇓). Whereas IL-12 p70 together with TNF-α induced low levels of IFN-γ, the amount of IFN-γ was much higher when IL-12 p70 was added together with IL-18. Surprisingly, a further synergistic enhancement of IFN-γ secretion was obtained when splenocytes were stimulated with the combination of all three cytokines. However, IFN-γ levels secreted by Bcl-3−/− and wild-type splenocytes were similar under all conditions. From these results, we concluded that Bcl-3 is not involved in the direct regulation of IFN-γ expression. In vitro IFN-γ production in splenocytes from Bcl-3−/− and wild-type control mice. Splenocytes were stimulated with the indicated combinations of IL-12 p70, IL-18, and TNF-α. Culture supernatants were collected 24 h poststimulation and assayed for IFN-γ by ELISA. Data represent mean values and SDs of five independent experiments. In the early phases of bacterial infection, macrophages are one of the main producers of IL-12 p70, TNF-α, and IL-10 (26). To determine the role of Bcl-3 in the expression of these and other cytokines in macrophages, the secretion and relative mRNA-levels of IL-12 p70 (IL-12 p35, respectively), IL-12 p40, TNF-α, IL-10, IL-1β, and IL-6 were measured from Bcl-3−/− and wild-type thioglycollate-elicited peritoneal macrophages upon activation by LPS. As expected, the expression of IL-10 was elevated substantially in Bcl-3−/− macrophages compared with wild-type cells (Fig. 4⇓A). This effect was already evident in unstimulated macrophages (1.7-fold) and further increased to 3-fold IL-10 mRNA levels 1 and 2 h after LPS stimulation and to 10-fold levels after 4 and 6 h of stimulation (Fig. 4⇓B). On the other hand, the synthesis of IL-12 p70 was significantly reduced in Bcl-3−/− macrophages compared with controls. This correlated with a diminished expression both of IL-12 p40 and IL-12 p35 mRNA in Bcl-3−/− cells, an effect that was obvious only 4 and 6 h after LPS stimulation (Fig. 4⇓B). Similarly, the expression of IL-6 and, to a lesser extent TNF-α, was down-regulated only at these later times. Thus, it appeared that the diminished expression of the proinflammatory cytokines in Bcl-3−/− macrophages was due to the excessive secretion of IL-10. To test this, Bcl-3−/− and wild-type macrophages were activated by LPS in the presence of the neutralizing anti-IL-10 or an isotype-control Ab for 6 h, and the mRNA expression of cytokines was analyzed by quantitative real-time RT-PCR. Whereas expression of IL-12 p35 mRNA in Bcl-3−/− macrophages was ∼20% of levels of control cells in the presence of the isotype-control Ab, IL-12 p35 mRNA levels increased to 75% of levels of control cells in the presence of IL-10-neutralizing Ab (Fig. 4⇓C). Similarly, the decreased mRNA levels of the other proinflammatory cytokines in Bcl-3−/− macrophages were adjusted to control levels by the presence of anti-IL-10 Ab. This demonstrates that the main difference in the expression of IL-12 p70 and the other proinflammatory cytokines in Bcl-3−/− macrophages is attributable to overproduction of IL-10. However, the anti-IL-10 Ab had no influence on the expression of IL-10 itself, indicating that IL-10 alone does not autoregulate its own expression in peritoneal macrophages after stimulation with LPS. Taken together, these data indicate that Bcl-3 inhibits the expression of IL-10 in peritoneal macrophages after stimulation with LPS. In vitro production of cytokines by Bcl-3−/− and wild-type control macrophages. A, Production of IL-12 p40, IL-12 p70, TNF-α, IL-10, IL-1β, and IL-6 from LPS-stimulated, thioglycollate-elicited peritoneal macrophages. The supernatants of peritoneal macrophages stimulated with 100 ng/ml LPS for the indicated time periods were collected and assayed for the production of the indicated cytokines by ELISA. Data represent mean values and SDs of two independent experiments with pooled macrophages from six Bcl-3−/− and six wild-type control mice. B, Cytokine mRNA expression in peritoneal macrophages stimulated with LPS. Thioglycollate-elicited macrophages were stimulated with 100 ng/ml LPS, and total RNA was isolated over a 6-h time course. Quantitative real-time RT-PCR was performed to examine the mRNA levels of IL-12 p40, IL-12 p35, TNF-α, IL-10, IL-1β, and IL-6. The results are given as mRNA levels in relation to the wild-type control (0 h) mRNA level. Data represent mean values and SDs of two independent experiments each with pooled macrophages from six Bcl-3−/− and six wild-type control mice. 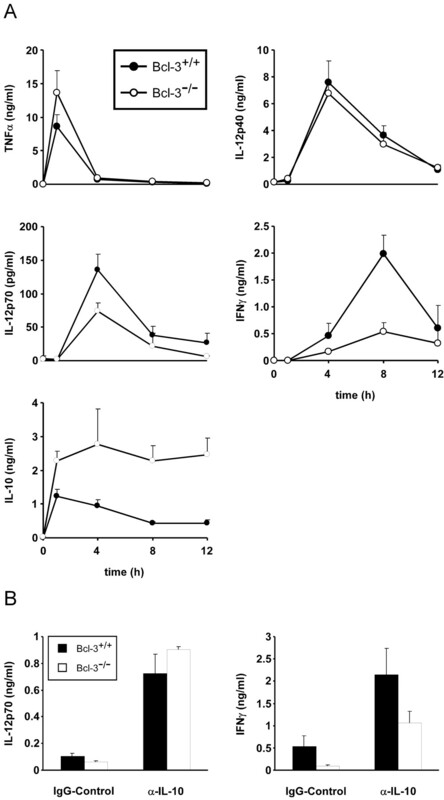 C, Expression of IL-12 p35, IL-12 p40, TNF-α, IL-10, IL-1β, and IL-6 in LPS-stimulated, thioglycollate-elicited peritoneal macrophages in the presence of a neutralizing anti-IL-10 Ab. Peritoneal macrophages were stimulated for 6 h with 100 ng/ml LPS in the presence of a neutralizing anti-IL-10 Ab at 20 μg/ml or an isotype-matched control Ab. Total RNA was isolated, and quantitative real-time RT-PCR was performed to examine the respective cytokine mRNA expression. Error bars indicate duplicate PCR values performed with pooled macrophages of six Bcl-3−/− and six wild-type control mice. Because Bcl-3 expression itself has been shown previously to be induced in response to various stimuli, including IL-10 (15, 31, 32), we were interested whether LPS stimulation leads to Bcl-3 induction in wild-type peritoneal macrophages. Western blot analysis showed that Bcl-3 is already expressed at low levels in unstimulated macrophages and is up-regulated beginning 2 h after LPS stimulation (Fig. 5⇓A). Interestingly, the newly synthesized Bcl-3 has a lower m.w. than constitutively expressed Bcl-3. However, it appears that it is gradually converted to the higher m.w. form 4 and 8 h after stimulation. The reduction of the m.w. by CIP treatment of an 8-h extract indicates that the difference is due to posttranslational phosphorylation (Fig. 5⇓B). As examined by quantitative real-time RT-PCR, the time course of Bcl-3 mRNA induction was similar to IL-10 mRNA, suggesting that autocrine IL-10 might be responsible for Bcl-3 induction (Fig. 5⇓C). Indeed, the Bcl-3 mRNA induction was reduced in macrophages in the presence of the IL-10-neutralizing Ab compared with cells treated with the isotype control Ab (Fig. 5⇓D). However, although IL-10 induced Bcl-3 protein with a time course similar to LPS, Bcl-3 expression was considerably enhanced when macrophages were stimulated with IL-10 and LPS together (Fig. 5⇓E). This indicates that LPS induces Bcl-3 expression via both IL-10-dependent and -independent pathways. Expression of Bcl-3 in thioglycollate-elicited peritoneal macrophages. A, Production of Bcl-3 protein after LPS stimulation. Peritoneal macrophages from wild-type mice were stimulated with LPS (100 ng/ml), and whole-cell protein extracts were prepared at the times indicated. Equal amounts of protein were analyzed by Western blot analysis with an Ab specific for Bcl-3. B, Phosphorylation of Bcl-3. Aliquots of the whole-cell protein extract prepared 8 h after LPS stimulation of peritoneal macrophages were incubated with or without CIP and analyzed by Western blot analysis with an Ab against Bcl-3. C, Expression of Bcl-3 mRNA after LPS stimulation. Peritoneal macrophages were stimulated with 100 ng/ml LPS, and total RNA was isolated over a 6-h time course. Real-time quantitative PCR was performed to examine the Bcl-3 mRNA levels. The results are given as mRNA levels in relation to the control (0 h) mRNA level. Data represent mean values and SDs of two independent experiments each with pooled macrophages from six Bcl-3−/− and six wild-type control mice. D, Expression of Bcl-3 in LPS-stimulated peritoneal macrophages in the presence of a neutralizing anti-IL-10 Ab. Peritoneal macrophages were stimulated for 6 h with 100 ng/ml LPS in the presence of a neutralizing anti-IL-10 Ab at 20 μg/ml or an isotype-matched control Ab. Total RNA was isolated, and real-time quantitative PCR was performed to examine Bcl-3 mRNA expression. Error bars indicate duplicate PCR values performed with pooled macrophages of six Bcl-3−/− and six wild-type control mice. E, Production of Bcl-3 protein in response to IL-10 alone or in combination with LPS. Peritoneal macrophages from wild-type mice were stimulated with IL-10 (25 ng/ml), LPS (100 ng/ml), or both, and whole-cell protein extracts were prepared at the times indicated. Equal amounts of protein were analyzed by Western blot analysis with an Ab specific for Bcl-3. IL-10 is supposed to be constitutively transcribed at low levels in macrophages due to regulation by transcription factors SP1 and SP3 (33, 34). Up-regulation of IL-10 mRNA after LPS challenge is attributed both to enhancement of transcription by inducible transcription factors and to an increase in IL-10 mRNA stability (35, 36). To exclude a role for Bcl-3 in regulating IL-10 mRNA stability, the half-life of IL-10 mRNA was analyzed in Bcl-3−/− and wild-type macrophages 2 h after stimulation with LPS. Although the amount of IL-10 mRNA was three times elevated in the Bcl-3−/− macrophages, it was degraded with the same half-life (∼30 min) as in wild-type macrophages (Fig. 6⇓A). 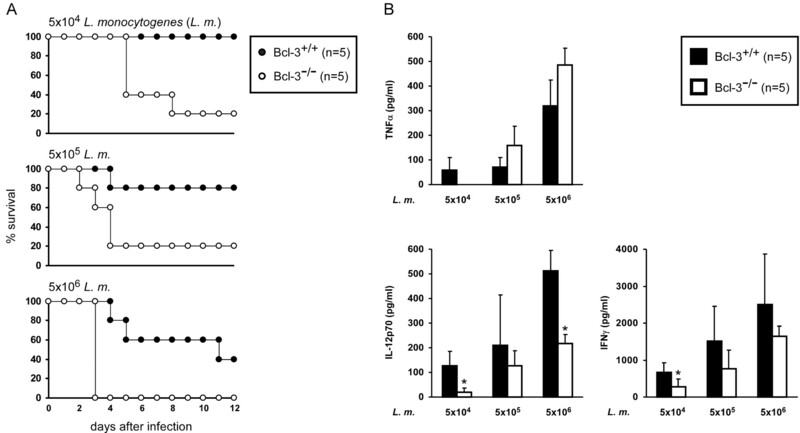 These results strongly suggest that Bcl-3 inhibits the transcription of IL-10. Transcriptional activation of inducible genes is most often accomplished by increased recruitment of RNA polymerase II to the respective transcriptional start sites (3, 4). Therefore, ChIPs using an RNA polymerase II-specific Ab were conducted in Bcl-3−/− and wild-type macrophages to investigate whether Bcl-3 regulates the initiation of IL-10 transcription. Corresponding to IL-10 mRNA levels, RNA polymerase II recruitment to the IL-10 promoter was induced both in Bcl-3−/− and wild-type macrophages with a peak 2 h after LPS stimulation and a decrease thereafter (Fig. 6⇓B). However, RNA polymerase II binding was highly increased at all time points in Bcl-3−/− cells, supporting the hypothesis that Bcl-3 inhibits the initiation of IL-10 transcription. To evaluate whether these alterations in Bcl-3−/− macrophages were specific for the IL-10 promoter, RNA polymerase II binding was also examined at the IL-6 promoter. Corresponding to IL-6 expression, RNA polymerase II binding was strongly induced in Bcl-3−/− and wild-type macrophages after stimulation with LPS. However, in contrast to the IL-10 promoter, recruitment of RNA polymerase II was even decreased in Bcl-3−/− macrophages compared with wild-type cells. This difference, that was most obvious 4 h after stimulation, probably reflects the inhibition of IL-6 expression by excessive autocrine IL-10 in Bcl-3−/− macrophages. Thus, together these data show that Bcl-3 specifically inhibits transcription of IL-10 in macrophages. IL-10 mRNA stability and transcription in Bcl-3−/− and wild-type control macrophages. A, IL-10 mRNA stability assay. Thioglycollate-elicited peritoneal macrophages pooled from six Bcl-3−/− and six wild-type control mice were treated with LPS (100 ng/ml) for 2 h. Actinomycin D (10 μg/ml) was added and incubation continued for the indicated times before total RNA was isolated, and IL-10 mRNA was analyzed by quantitative real-time RT-PCR and normalized to cyclophilin mRNA levels. Data points represent the remaining IL-10 mRNA in the percentage of the respective amount at the time of actinomycin D addition. Similar results were obtained in three separate experiments. B, ChIP analysis of the occupancy of the IL-10 and IL-6 promoters in Bcl-3−/− and wild-type control macrophages. ChIP experiments were performed with Bcl-3−/− and wild-type control thioglycollate-elicited peritoneal macrophages at the indicated times after stimulation with LPS (100 ng/ml) using an Ab specific for RNA-polymerase II (RNA-Pol II). Precipitated DNA was analyzed by PCR using primers encompassing the indicated positions in the respective promoters. PCR was also performed with 2.5% of input chromatin to ensure equal loading. To gain insights into the physiological and molecular functions of the IκB family member Bcl-3, mice with a targeted disruption of the Bcl-3 gene were generated. We found that Bcl-3−/− mice are more susceptible to an infection with L. monocytogenes than wild-type littermate controls. It is well established that during the early phases of L. monocytogenes infection, the innate immune system curbs the growth of the bacteria, which are later fully eradicated by adaptive immune responses (37). Because most Bcl-3−/− mice succumbed to the infection only 3–5 days after inoculation, it appears that Bcl-3 plays an essential role in innate immunity. Although a previous study has implicated Bcl-3 as an essential factor in immune responses to bacteria (16), involved cell types and target genes affected by loss of Bcl-3 remained unknown. Innate immune responses are critically dependent on an interplay between macrophages and NK cells (26). Tissue macrophages respond to the perception of microorganisms with phagocytosis of the pathogens and the production of cytokines. Among these, TNF-α, IL-12 p70, and IL-18 induce the secretion of IFN-γ from NK cells. IFN-γ then converts macrophages harboring pathogens to a microbicidal state, in which bactericidal agents such as NO and reactive oxygen intermediates are produced to kill the bacteria (38). Although we cannot exclude a direct role of Bcl-3 in the regulation of bactericidal mechanisms, the incapability of Bcl-3−/− mice to produce sufficient amounts of IFN-γ after L. monocytogenes infection likely accounts for their increased susceptibility to this pathogen. 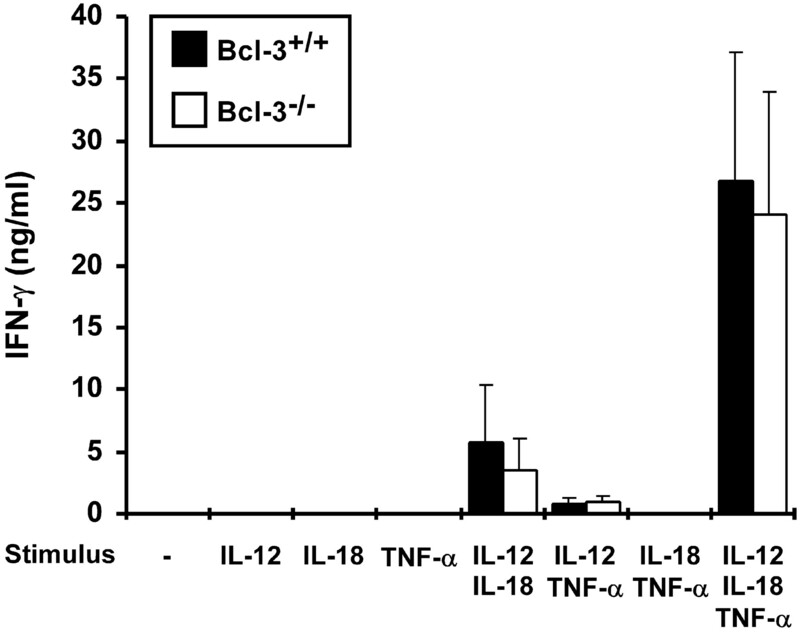 Defective IFN-γ expression in Bcl-3−/− mice is mainly due to elevated production of IL-10 that was observed in Bcl-3−/− mice after LPS injection, as well as in Bcl-3−/− macrophages in response to LPS. In both cases, elevated IL-10 production elicited a down-regulation of IL-12 p70, the most potent inducer of IFN-γ. Thus, overproduction of IL-10 in Bcl-3−/− macrophages appears to be the primary cause that accounts for the susceptibility of Bcl-3−/− mice to L. monocytogenes infection. Consistent with our findings, an inhibitory role of IL-10 in the innate resistance to L. monocytogenes was established previously. Whereas the overexpression of an IL-10 transgene in APCs resulted in higher susceptibility, the immunity to L. monocytogenes infection was increased in IL-10−/− mice (22, 23). Thus, during an infection with L. monocytogenes, Bcl-3 plays an essential proinflammatory function, namely the inhibition of IL-10 production in macrophages. However, Bcl-3−/− mice still produced slightly lower levels of IFN-γ than wild-type mice when endogenous IL-10 was neutralized during the LPS response. This points to another IL-10-independent mechanism that is responsible for diminished IFN-γ expression in Bcl-3−/− mice. A role for NF-κB/Rel proteins in the transcriptional regulation of IFN-γ through a potential κB-site in the first intron of the human IFN-γ gene has been proposed (39). However, our data demonstrate that splenocytes from Bcl-3−/− and wild-type control mice secreted comparable amounts of IFN-γ in response to IL-12 p70, TNF-α, and IL-18, indicating that Bcl-3 is not involved in the direct regulation of murine IFN-γ. It is well established that expression of TNF-α is inhibited by IL-10 (28). Recently, it has been shown that in macrophages IL-10-induced Bcl-3 is responsible for transcriptional inhibition of TNF-α at low concentrations of IL-10 (32). This is consistent with our finding of slightly increased levels of TNF-α during L. monocytogenes infection or LPS injection in Bcl-3−/− mice compared with wild-type mice. In contrast, expression of TNF-α was still down-regulated by autocrine IL-10 in Bcl-3−/− thioglycollate-elicited peritoneal macrophages after LPS stimulation, probably reflecting a higher concentration of IL-10, that was shown to inhibit TNF-α expression by a Bcl-3-independent mechanism (32). Higher amounts of IL-10 in the macrophage culture might also explain why IL-12 p40 expression was differently down-regulated by IL-10 in Bcl-3−/− and wild-type macrophages, while its synthesis after LPS challenge in vivo was the same in Bcl-3−/− and wild-type mice. In human and murine Kupffer cells, IL-10 negatively controls its own transcription (40). Because Bcl-3 is induced by IL-10 in macrophages (this article and Ref.32) and inhibits the transcription of the IL-10 gene, it appears that Bcl-3 might play an integral part in a negative feedback mechanism by which IL-10 limits its own production. The finding that LPS also induces Bcl-3 in peritoneal macrophages might explain why the neutralizing anti-IL-10 Ab had specifically no effect on the expression of IL-10 after LPS stimulation. The IL-10 gene expression in macrophages is intricately regulated by transcriptional and by mRNA-stabilizing mechanisms. Recent work has shown that the transcription factors SP1 and SP3 are responsible for constitutive transcription of IL-10 (33, 34). LPS stimulation causes both an enhancement of transcription by activation of inducible transcription factors, such as C/EBPβ and C/EBPδ, and a stabilization of IL-10 mRNA (35, 36). In the present study, we show that Bcl-3 is not implicated in IL-10 mRNA stabilization but regulates transcription of the IL-10 gene. However, the molecular mechanism by which Bcl-3 controls IL-10 transcription remains elusive. Previous results have shown that Bcl-3 can regulate DNA binding of NF-κB complexes and/or can act as a transcriptional cofactor via DNA-bound p50- and p52-homodimers (3, 7, 8, 9, 10, 11, 12, 13, 14, 15, 32). Thus, our data suggest an implication of NF-κB in the transcriptional regulation of IL-10. Both the murine and human IL-10 promoters contain two distal κB-motifs, which interact with NF-κB complexes in EMSAs (Ref.41 and own unpublished observations). However, the functional relevance of these sites for IL-10 transcription has not been investigated so far. Taken together, our results demonstrate that transcription of IL-10 is inhibited by Bcl-3 in macrophages. Moreover, we provide evidence that this Bcl-3 function is highly significant for the formation of an appropriate innate immune response against bacterial infections in mice. Because IL-10 plays a beneficial role in several inflammatory diseases, the examination of Bcl-3−/− mice in distinct models of inflammation will be interesting and useful for evaluating whether Bcl-3 might be a promising target for treatment of inflammatory disorders. We thank Ulrike Huffstadt for technical help and Hana Algul, Gunther Schneider, and Jens T. Siveke for critical reading of the manuscript. ↵1 This work was supported in part by Interdisziplinäres Zentrum für Klinische Forschung projects E7 and H5 (to R.M.S. and S.L.) and by the Sonderforschungsbereich 576 Teilprojekt A10 (to R.M.S.). ↵3 Abbreviations used in this paper: neo, neomycin; tk, thymidine kinase; CIP, calf intestine phosphatase; ChIP, chromatin immunoprecipitation. Ghosh, S., M. J. May, E. B. Kopp. 1998. NF-κB and Rel proteins: evolutionarily conserved mediators of immune responses. Annu. Rev. Immunol. 16:225.-260. Karin, M.. 1999. How NF-κB is activated: the role of the IκB kinase (IKK) complex. Oncogene 18:6867.-6874. Baek, S. H., K. A. Ohgi, D. W. Rose, E. H. Koo, C. K. Glass, M. G. Rosenfeld. 2002. Exchange of N-CoR corepressor and Tip60 coactivator complexes links gene expression by NF-κB and β-amyloid precursor protein. Cell 110:55.-67. Saccani, S., S. Pantano, G. Natoli. 2003. Modulation of NF-κB activity by exchange of dimers. Mol. Cell 11:1563.-1574. Leung, T. H., A. Hoffmann, D. Baltimore. 2004. One nucleotide in a κB site can determine cofactor specificity for NF-κB dimers. Cell 118:453.-464. Ohno, H., G. Takimoto, T. W. McKeithan. 1990. The candidate proto-oncogene bcl-3 is related to genes implicated in cell lineage determination and cell cycle control. Cell 60:991.-997. Bours, V., G. Franzoso, V. Azarenko, S. Park, T. Kanno, K. Brown, U. Siebenlist. 1993. The oncoprotein Bcl-3 directly transactivates through kappa B motifs via association with DNA-binding p50B homodimers. Cell 72:729.-739. Nolan, G. P., T. Fujita, K. Bhatia, C. Huppi, H. C. Liou, M. L. Scott, D. Baltimore. 1993. The Bcl-3 proto-oncogene encodes a nuclear IκB-like molecule that preferentially interacts with NF-κB p50 and p52 in a phosphorylation-dependent manner. Mol. Cell. Biol. 13:3557.-3566. Fujita, T., G. P. Nolan, H. C. Liou, M. L. Scott, D. Baltimore. 1993. The candidate proto-oncogene bcl-3 encodes a transcriptional coactivator that activates through NF-κB p50 homodimers. Genes Dev. 7:1354.-1363. Heissmeyer, V., D. Krappmann, F. G. Wulczyn, C. Scheidereit. 1999. NF-κB p105 is a target of IκB kinases and controls signal induction of Bcl-3-p50 complexes. EMBO J. 18:4766.-4778. Franzoso, G., V. Bours, S. Park, M. Tomita-Yamaguchi, K. Kelly, U. Siebenlist. 1992. The candidate oncoprotein Bcl-3 is an antagonist of p50/NF-κB-mediated inhibition. Nature 359:339.-342. Dechend, R., F. Hirano, K. Lehmann, V. Heissmeyer, S. Ansieau, F. G. Wulczyn, C. Scheidereit, A. Leutz. 1999. The Bcl-3 oncoprotein acts as a bridging factor between NF-κB/Rel and nuclear co-regulators. Oncogene 18:3316.-3323. Caamano, J. H., P. Perez, S. A. Lira, R. Bravo. 1996. Constitutive expression of Bcl-3 in thymocytes increases the DNA binding of NF-κB1 (p50) homodimers in vivo. Mol. Cell. Biol. 16:1342.-1348. Watanabe, N., T. Iwamura, T. Shinoda, T. Fujita. 1997. Regulation of NFΚB1 proteins by the candidate oncoprotein BCL-3: generation of NF-κB homodimers from the cytoplasmic pool of p50–p105 and nuclear translocation. EMBO J. 16:3609.-3620. Brasier, A. R., M. Lu, T. Hai, Y. Lu, I. Boldogh. 2001. NF-κB-inducible Bcl-3 expression is an autoregulatory loop controlling nuclear p50/NF-κB1 residence. J. Biol. Chem. 276:32080.-32093. Schwarz, E. M., P. Krimpenfort, A. Berns, I. M. Verma. 1997. Immunological defects in mice with a targeted disruption in Bcl-3. Genes Dev. 11:187.-197. Franzoso, G., L. Carlson, T. Scharton-Kersten, E. W. Shores, S. Epstein, A. Grinberg, T. Tran, E. Shacter, A. Leonardi, M. Anver, et al 1997. Critical roles for the Bcl-3 oncoprotein in T cell-mediated immunity, splenic microarchitecture, and germinal center reactions. Immunity 6:479.-490. Zhang, G., S. Ghosh. 2001. Toll-like receptor-mediated NF-κB activation: a phylogenetically conserved paradigm in innate immunity. J. Clin. Invest. 107:13.-19. Kuhn, R., J. Lohler, D. Rennick, K. Rajewsky, W. Muller. 1993. Interleukin-10-deficient mice develop chronic enterocolitis. Cell 75:263.-274. Gazzinelli, R. T., M. Wysocka, S. Hieny, T. Scharton-Kersten, A. Cheever, R. Kuhn, W. Muller, G. Trinchieri, A. Sher. 1996. In the absence of endogenous IL-10, mice acutely infected with Toxoplasma gondii succumb to a lethal immune response dependent on CD4+ T cells and accompanied by overproduction of IL-12, IFN-γ and TNF-α. J. Immunol. 157:798.-805. Dai, W. J., G. Kohler, F. Brombacher. 1997. Both innate and acquired immunity to Listeria monocytogenes infection are increased in IL-10-deficient mice. J. Immunol. 158:2259.-2267. Groux, H., F. Cottrez, M. Rouleau, S. Mauze, S. Antonenko, S. Hurst, T. McNeil, M. Bigler, M.-G. Roncarolo, R. L. Coffman. 1999. A transgenic model to analyze the immunoregulatory role of IL-10 secreted by antigen-presenting cells. J. Immunol. 162:1723.-1729. Lang, R., R. L. Rutschmann, D. R. Greaves, P. J. Murray. 2002. Autocrine deactivation of macrophages in transgenic mice constitutively overexpressing IL-10 under control of the human CD68 promoter. J. Immunol. 168:3402.-3411. Endres, R., A. Luz, H. Schulze, H. Neubauer, A. Futterer, S. M. Holland, H. Wagner, K. Pfeffer. 1997. Listeriosis in p47phox−/− and TRp55−/− mice: protection despite absence of ROI and susceptibility despite presence of RNI. Immunity 7:419.-432. Unanue, E. R.. 1997. Inter-relationship among macrophages, natural killer cells and neutrophils in early stages of Listeria resistance. Curr. Opin. Immunol. 9:35.-43. Wysocka, M., M. Kubin, L. Q. Vieira, L. Ozmen, G. Garotta, P. Scott, G. Trinchieri. 1995. Interleukin-12 is required for interferon γ production and lethality in lipopolysaccharide-induced shock in mice. Eur. J. Immunol. 25:672.-676. Fiorentino, D.F., A. Zlotnik, T. R. Mosmann, M. Howard, A. O’Garra. 1991. IL-10 inhibits cytokine production by activated macrophages. J. Immunol. 147:3815.-3822. D’Andrea, A., M. Aste-Amezaga, N. M. Valiante, X. Ma, M. Kubin, G. Trinchieri. 1993. Interleukin 10 (IL-10) inhibits human lymphocyte interferon γ-production by suppressing natural killer cell stimulatory factor/IL-12 synthesis in accessory cells. J. Exp. Med. 178:1041.-1048. Aste-Amezaga, M., X. Ma, A. Sartori, G. Trinchieri. 1998. Molecular mechanisms of the induction of IL-12 and its inhibition by IL-10. J. Immunol. 160:5936.-5944. Richard, M., J. Louahed, J. Demoulin, J. Renauld. 1999. Interleukin-9 regulates NF-κB activity through BCL3 gene induction. Blood 93:4318.-4327. Kuwata, H., Y. Watanabe, H. Miyoshi, M. Yamamoto, T. Kaisho, K. Takeda, S. Akira. 2003. IL-10-inducible Bcl-3 negatively regulates LPS-induced TNF-α production in macrophages. Blood 102:4123.-4129. Brightbill, H. D., S. E. Plevy, R. L. Modlin, S. T. Smale. 2000. A prominent role for Sp1 during lipopolysaccharide-mediated induction of the IL-10 promoter in macrophages. J. Immunol. 164:1940.-1951. Tone, M., M. J. Powell, Y. Tone, S. A. J. Thompson, H. Waldmann. 2000. IL-10 gene expression is controlled by the transcription factors Sp1 and Sp3. J. Immunol. 165:286.-291. Powell, M. J., S. A. J. Thompson, Y. Tone, H. Waldmann, M. Tone. 2000. Posttranscriptional regulation of IL-10 gene expression through sequences in the 3′-untranslated region. J. Immunol. 165:292.-296. Liu, Y.-W., H.-P. Tseng, L.-C. Chen, B.-K. Chen, W.-C. Chang. 2003. Functional cooperation of simian virus 40 promoter factor 1 and CCAAT/enhancer-binding protein β and δ in lipopolysaccharide-induced gene activation of IL-10 in mouse macrophages. J. Immunol. 171:821.-828. Edelson, B. T., E. R. Unanue. 2000. Immunity to Listeria infection. Curr. Opin. Immunol. 12:425.-431. Shiloh, M. U., J. D. MacMicking, S. Nicholson, J. E. Brause, S. Potter, M. Marino, F. Fang, M. Dinauer, C. Nathan. 1999. Phenotype of mice and macrophages deficient in both phagocyte oxidase and inducible nitric oxide synthase. Immunity 10:29.-38. Sica, A., L. Dorman, V. Viggiano, M. Cippitelli, P. Ghosh, N. Rice, H. A. Young. 1997. Interaction of NF-κB and NFAT with the interferon γ promoter. J. Biol. Chem. 272:30412.-30420. Knolle, P. A., A. Uhrig, U. Protzer, M. Trippler, R. Duchmann, K. H. Meyer zum Buschenfelde, G. Gerken. 1998. Interleukin-10 expression is autoregulated at the transcriptional level in human and murine Kupffer cells. Hepatology 27:93.-99. Mori, N., D. Prager. 1997. Activation of the interleukin-10 gene in the human T lymphoma line HuT 78: identification and characterization of NF-κB binding sites in the regulatory region of the interleukin-10 gene. Eur. J. Haematol. 59:162.-170.